Susanne Gaensheimer appointed curator of 13th Fellbach Triennial of Small-Scale Sculpture 2016. 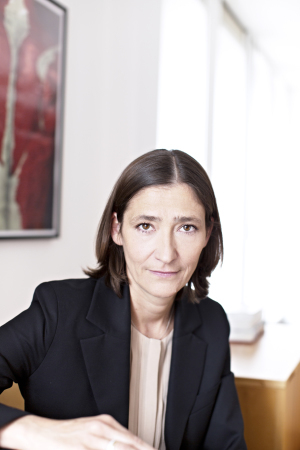 Susanne Gaensheimer is director of the MMK Museum für Moderne Kunst in Frankfurt am Main, a position to which she was appointed in 2009. From 2001 to 2008 she was manager and curator of the contemporary art collection at the Städtische Galerie im Lenbachhaus in Munich and from 1999 to 2001 director of the Westfälischer Kunstverein in Münster. In 2011 and 2013 she curated the German pavilion at the Venice Biennial. Dedicated to the late Christoph Schlingensief, the 2011 pavilion was awarded the Golden Lion for best national pavilion. Since 2012 Susanne Gaensheimer has been a member of the acquisitions committee of the German federal collection of contemporary art and the Sparkasse cultural fund as well as being a member of the 2013 Turner Prize jury, the selection committees for the curator of the 7th and 8th Berlin Biennales and for the curator of the 14th documenta, which will be held in Kassel in 2017. Since 2013 she has also been teaching at the Institute of Art History at the Goethe University in Frankfurt am Main. In 2014 she founded MMK 2 as a branch of the MMK Museum für Moderne Kunst. The Fellbach Triennial of Small-Scale Sculpture was established in 1980 as a forum for contemporary sculpture and has taken place at regular three-year intervals ever since. In 2001 the Triennial found a unique exhibition venue in the Alte Kelter, a historic winery converted into a cultural center in 2000 which provides 3000 square meters of exhibition space spanned by a soaring timber roof. The Triennial owes much of its consistent success to its curators. Triennials 1–7 followed geographical and geopolitical lines, but in 2001 it was decided to widen the event’s conceptual horizon, taking account of the globalization of the art world. While this enabled the curators to address aesthetic, art historical, and sociological issues, the strong emphasis on internationality persists, as does the focus on small-scale sculpture, although in a non-dogmatic view. The list of previous curators includes Manfred Schneckenburger and Catherine David (1986), Christoph Brockhaus (1989 and 1992), Lóránd Hegyi (1995), Thomas Deecke (2001), Jean-Christophe Ammann (2004), Matthias Winzen (2007), Ulrike Groos, director of the Kunstmuseum Stuttgart (2010), and, most recently, the tandem team consisting of Angelika Nollert, director of the Neue Sammlung at the Pinakothek der Moderne in Munich, and Yilmaz Dziewior, director of the Museum Ludwig in Cologne from February 2015. Image: Susanne Gaensheimer. Photo: Renato Ribeiro Alves / Courtesy Stadt Fellbach Kulturamt.